If you love Greek cuisine, you and your palate are sure to fall hard for The Zeta. 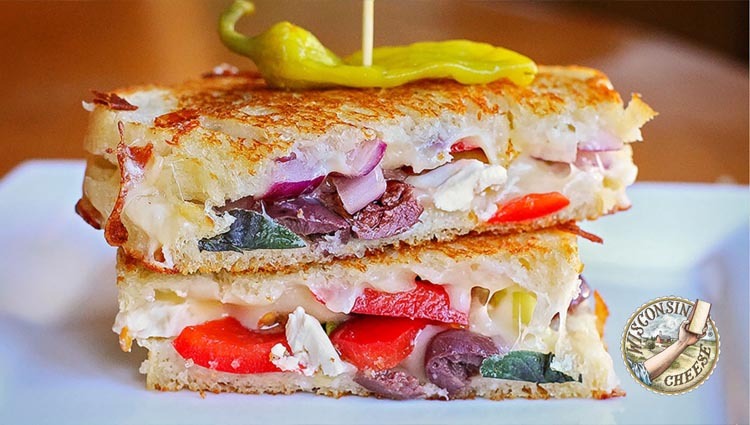 This creamy grilled cheese masterpiece is delicious assortment of Wisconsin mozzarella, cucumbers, red bell peppers, cherry tomatoes, Kalamata olives, and all the other goodies you can expect to find in a Greek salad. Creamy grilled cheese with Odyssey feta. Mix cucumber, tomato, red bell pepper, onion, olives and feta cheese in bowl. Place garlic, lemon juice, salt, pepper, oregano and olive oil in jar. Cover and shake until oil emulsifies. Pour over the salad and mix well. Heat nonstick skillet over medium. Butter 1 side of each bread slice. Place 1 bread slice, buttered-side-down in skillet. Place half the mozzarella cheese on slice, top with the Greek salad. Add remaining mozzarella cheese over and top with remaining slice of bread, buttered-side-up. Some salad and mozzarella will run off into skillet. Gently lift bottom bread to check. When golden brown, carefully flip sandwich to cook on the other side, reducing heat a bit to avoid burning bread. Press sandwich with spatula. When both sides are golden brown, remove from heat, slice in half and serve. Top with pepperoncini pepper if desired.